Dodgy At Best: Et Tu, Kanu? Sorry- today is 15 March: couldn't resist. I guess that makes me Brutus to March Madness's Caesar. It felt damn weird to walk to work today instead of down to the sportsbar, where right now I would be ordering breakfast rather than typing this. Sidenote - for a lifelong East Coaster, that in and of itself is weird, surreal, and bizarre: going to a sportsbar and ordering and eating breakfast while watching the first round of the tourney. Thankfully I have the Slingbox working for me so I'll be able to follow the action, if only one game at a time. I'm picking UCLA to beat Georgetown in the title game mostly because there is a history of teams making it to the Final Four and losing one year, and then the next year getting back to the Final Four and winning it all thanks to their experience. As far as just the matchup, I would think Georgetown would actually win the game. They are basically "The Princeton Offense On Steroids" to use Big East Ken's words, and their style will be so difficult for any team to prepare for and play against. But unlike Princeton in the past, this team plays that style but also has a boatload of talent, so I wouldn't be surprised if they won the whole thing. But for some reason I am going with the 'been there and been close last year, return all of our talent, and this year we will get back and do the damn thing'. The most important thing to root for, though, is what I first & foremost root for every year: the assurance that three teams that I despise cannot win it all. 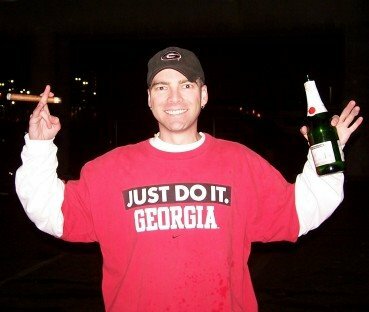 Every year I am not at peace and do not sleep well until Duke, Florida, and Georgia Tech have all been eliminated. Then I stand up from wherever I am sitting, dance a little jig, drink a beer, and move on with a glowing smile in my face and warm fuzzies in my soul. Sadly this moment never came to pass last year, so it is absolutely imperative that it does occur this year. Another damn Florida Gator National Title would really be unbearable. Enjoy the Madness, have fun, and Happy Brackets. Kanu, you know that CBS Sportsline is showing all the games for free online? It's literally a 30 second sign up screen then a 15 second commerical and all the games are online--and free! Quite amazing, if you ask me. Yeah, I saw that this morning actually, but then my day got beyond nutty so I just rocked the Slingbox on the local CBS feed occasionally throughout the day. Thanks for the tip though- I may try to rock it tomorrow.